It was an emotional celebration as South Africa (SA) remembered the life of late national hero Dr Oliver Mtukudzi yesterday afternoon. The memorial service held at Joburg Theatre, in Johannesburg saw a strong line-up of various internationally acclaimed musicians who have worked with Tuku over the years sharing his music. 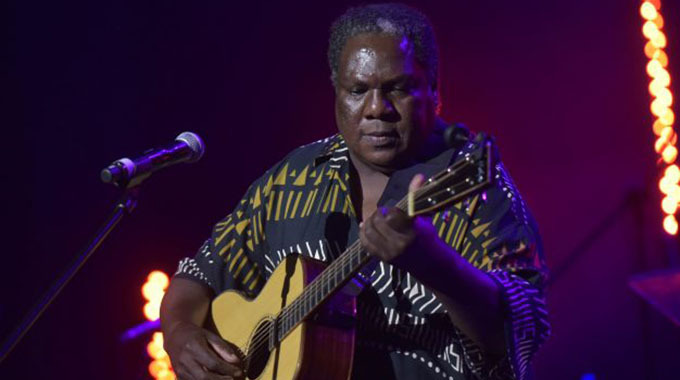 His band members from the Black Spirits; Charles Njekesa and Fiona Chidzomba were there to play beautiful music that reminded many of Tuku’s fans who filled up the venue. The duo reminded fans of the late music icon’s exceptional music that touches hearts of many. The two also shared memories from the time they spent with the superstar and the teachings he imparted in them. His daughters Selmor and Sandra, his son-in-law Tendai Manasta and protégés Norman Masamba and Mbeu all sang in Tuku’s honour. It was Mbeu who touched many hearts, playing with several artistes. He played Tuku’s parts as several artistes shared their collaborations with the late superstar. “I had a difficult time in South Africa as it was all very personal and emotional to me. Going on stage and singing his music was always a reminder that he (Tuku) is really gone. “I got to meet up with different artistes including Ringo, Judith Sephuma, and Siphokazi. I got to play with all of them on stage at the memorial. “The experience was overwhelming. It was a great opportunity to showcase at such a great platform, sad that it came when we are still in mourning,” said Mbeu. Tuku’s longtime friends and celebrated SA music icons Vusi Mahlesela and Steve Dyer were also there to share heart-catching music. In their speeches they promised never to forget their fallen hero. As much as people were entertained by celebrated stars onstage, the memorial was inclusive with the auditorium singing along to music on stage and reciting popular church hymns. Oliver Mtukudzi died late last month succumbing to a long battle with diabetes.